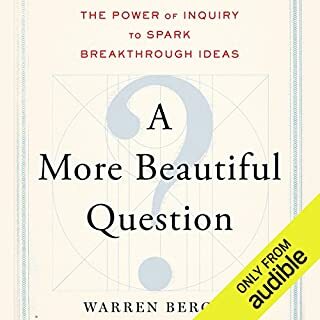 Winner of the Pulitzer Prize in 1974 and the culmination of a life's work, The Denial of Death is Ernest Becker's brilliant and impassioned answer to the "why" of human existence. In bold contrast to the predominant Freudian school of thought, Becker tackles the problem of the vital lie: man's refusal to acknowledge his own mortality. In doing so, he sheds new light on the nature of humanity and issues a call to life and its living that still resonates more than 30 years after its writing. I liked it and I don't even have kids. In Lords of Finance, we meet the neurotic and enigmatic Montagu Norman of the Bank of England, the xenophobic and suspicious Émile Moreau of the Banque de France, the arrogant yet brilliant Hjalmar Schacht of the Reichsbank, and Benjamin Strong of the Federal Reserve Bank of New York, whose facade of energy and drive masked a deeply wounded and overburdened man. After the First World War, these central bankers attempted to reconstruct the world of international finance. Despite their differences, they were united by a common fear - that the greatest threat to capitalism was inflation - and by a common vision that the solution was to turn back the clock and return the world to the gold standard. For a brief period in the mid-1920s, they appeared to have succeeded. The world's currencies were stabilized, and capital began flowing freely across the globe. But beneath the veneer of boomtown prosperity, cracks started to appear in the financial system. The gold standard that all had believed would provide an umbrella of stability proved to be a straitjacket, and the world economy began that terrible downward spiral known as the Great Depression. As yet another period of economic turmoil makes headlines today, the Great Depression and the year 1929 remain the benchmark for true financial mayhem. 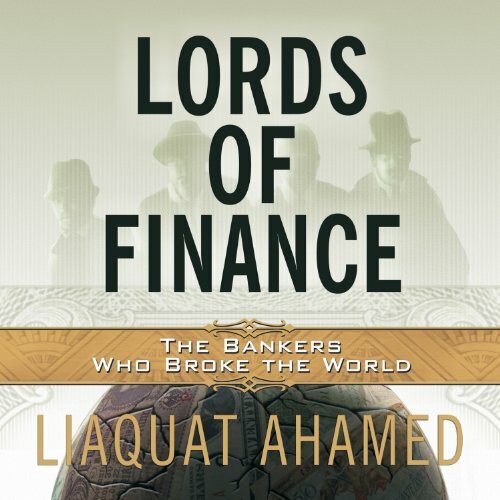 Offering a new understanding of the global nature of financial crises, Lords of Finance is a reminder of the enormous impact that the decisions of central bankers can have, of their fallibility, and of the terrible human consequences that can result when they are wrong. longish, but engaging historical narrative! related to you through mini-biographies of the main players of the time. easy to understand too, although due to its approach to the story (economics/finance), you might have to rewind sometimes to get the more technical aspects of his sweeping narrative. 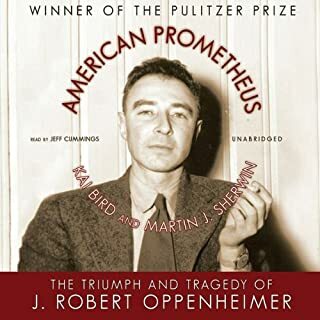 but highly recommended if you're looking to learn a thing or two about the Great Depression and some perspective on its connections to our current global economic crisis. 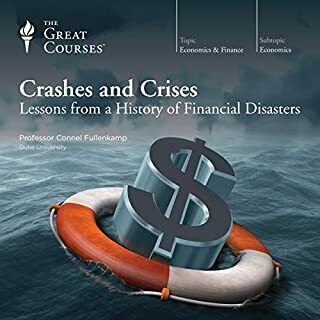 I thought this was a very well researched book, and it gives an interesting picture of what was going on with the global economy, mostly starting with WWI and leading up into the great depression. It's main focus is on the gold standard. I was really impressed by the narrator of this book - he really understood the material, and was able to do the accents of different characters in the book without making it too obtrusive. It's a long book but I think it could have seemed even longer without a good narrator. It was done very well. As has been discussed in prior reviews, this book focuses on the Great Depression and the events leading up to it beginning with the pre World War One period. While any of book of this sort will focus on economics, this one portrays the events through the biographies of the four central bankers of England (Montagu Norman), France (Emile Moreau), US (Benajmin Strong)and Germany (Hjalmar Schact) as well as other individuals who participated in the spectacle (John Maynard Keynes). The author does a great job in sketching portraits of each man. The book is extremely well written and read and merits the acclaim that it has received (Financial Times Award among others). 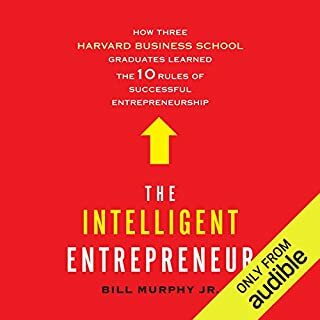 What I found to be extremely interesting is the eiplogue in which the author takes the thesis of the book and tries to compare and contrast it to more recent events (such as the financial crisis in Mexico in the early 1990's followed by the Russian and Emerging Markets fiasco in the late 1990's and even the financial crisis in 2008) and how the modern era central bankers took affirmative action to avoid a replay of the Great Depression. This book was very informative as well as enjoyable. It was interesting to see how four major countries (and their financial bankers) brought the world to their financial knees during the Great Depression. I could identify because there are parallels to what is happening today. I was compelled to keep listening. After I read Ben Bernake's comments in Time Magazine regarding the book's merit,I appreciated its value even more. This is an informative account of the characters who played major roles in the Great Depression told within a historical perspective. A great read. I had never heard of this author but this is quite an achievement. To read every minute of 4 central bankers' meetings over several decades must require intense discipline; to turn that into a readable, fascinating and clearly written book is a rare talent. How many of us can find Federal Reserve Bank Chairmen and Governors of the Bank of England remotely attractive characters? The true life stories of these people bring their personalities and characters into colored relief. This book is a treatise on Monetary Economics at the same time. The reader is good, even if his tendency to linger lovingly on the last syllable can become tiresome during a long session. I'd have given 4 1/2 Stars, reserving the '5 Star' accolade for a book yet to be read! This is a great book for understanding the history and workings of markets and central banks. 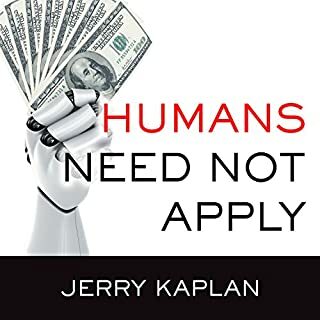 It is not a light listen but if you pay attention, you will gain an understanding of how government central banks can influence modern economies and markets. This book helps to explain how the reactions of the central bankers of the US, Britain, France and Germany to the economic challenges faced at the end of WWI led to financial chaos which made possible the rise of radical elements in Germany. The author does this by going into extensive detail of each of the central bankers. This makes the story much more personable and a bit less esoteric--no small feat when considering the topic. This book is brilliant. It makes its vast scope coherent, explains the complex issues involved clearly, retains detail and personal interest to make the story riveting from both a macro and micro level. The reader has the two most important attributes of a reader-his voice does not grate and HE KNOWS HIS MATERIAL. Can not recommend this book too highly. What did you love best about Lords of Finance? Opened my eyes the way the media should have been didn't. Not even close. Irregardless of your background/interests you cannot read this book without becoming emotional. Spoiler alert: it wasn't the stock market crashing that caused the Great Depression. Yoiks! Talk about history repeating itself. I have no background in finance or economics but do now: after reading Sylvia Nassar's "Grand Pursuit" (good beginning and end but my interest waned in mid to last quarter) followed by LoF (preferred LoF much more) I feel entitled to an opinion on the feckless leadership between Wilson and Truman administrations. High school, college students and people I regard as literate are oblivious to the post WWI flight of gold from the Bank of New York to the Exchequer, an unbelievable racking up of bad loans to prop Britain's pound by that axis of evil Montagu Norman and Strong, may they burn forever (when you read this book I dare you to remain non-judgemental). Citizens will find this remarkable given that recent bad bit of luck in the subprimes, AG and S sleepwalking all the while despite poor B. Bourne banging the alarm. Funny, nobody went to jail in either depression. Maybe you should read this book and do your part to prevent the next humiliating repetition? Can finance be fascinating? Yes! Both the author and narrator pulled this rabbit out of a hat. Most commendable. Some facts were incredulous but the narrator maintained equanimity and balance. How did you muster self control? It's okay to react when people do foolish things. Let yourself go. Can you write another book about another boring subject I know nothing about? I can't believe how interesting and dastardly people who were "looking out for us" were NOT. I'll unhesitatingly buy it. Four bankers whom time forgot, each damaged in a unique manner, together reflecting the conventional wisdom of the day and a token smattering of unruly disorder: the book tells the story of the Depression, the interwar period, and the desperate efforts of a small gang of men determined to do well by their countries with what tools economics then made available. Lords of Finance should be mandatory reading for those bewitched by the wisdom of any era, a humbling testament to celebrity worship of "great, wise old men" - who bumbling, groping, did the best they can in a complex world. The heady economic analysis paints the precise uncertainties with which they grappled, while the human victories and tragedies convey a fair sense of the men doing the grappling. Schacht, arrogant and disgraced, emerges as a financial wizard from the broom closet to rescue Germany from hyperinflation (or to claim credit for so doing). Strong, plucked from an auspicious morning trade route to work to the heights of power, then crushed. Norman, painted as eccentric by his incapacity for public performance. And Moreau, saddled with a corrupt mentor, striving to buy time for a France no longer capable of challenging the world. Each played his part in the ensemble, and Ahamed makes a good case for their relevance - but this story of humanized economics as lived, mistakes as realized, and mixed foresight and blindness serves today's readers well - not as a warning about any specific failing, but as a humbling exercise - a "memento mori" for modernity. Too many history books give short shrift to the role of finances on the course of history. This book fills in a major plot hole about what went on between the two world wars. 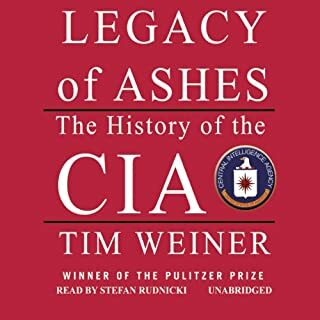 Ahamed does a great job of giving us a play-by-play of how the major central banks attempted to respond to events, including a clear picture of how the decision making process was affected by individual personalities and legacy dogma from the past. I wish the author had interspersed more of his analysis with the main text instead of saving it for the end. Ahamed builds a strong case that the gold standard was a key factor leading to dysfunctional decisions. As far as building a case that these bankers bungled their jobs, he would do better if he could come up with decisions that would have led to a better outcome. As it is, he shows people boxed in by circumstances beyond their control. In most of the situations he goes over, it appears they made the best choice available to them, and that in itself makes for a compelling if tragic story. In fact, I wish more time had been spent on analysis overall. An economics book targeted at the mainstream audience should at least spend more time explaining about the balance of payments, and about how the trading in government securities affects trade in the private sector. But these are relatively minor complaints. Stephen Hoye is not my favorite narrator. He has one of those superior sounding voices that imply he knows what he's talking about. I understand some people find that reassuring. If hearing someone read a book on economics and referring to "John Maynard KEENZ" all the way through doesn't bother you, then maybe you won't mind Mr. Hoye's narration. I found the British accent annoying, as he used the same one for every British person in the story, from Churchill to Keynes. Yet the other nationalities were either very mild or nonexistent as far as accents go.